An illustration made of the missing buffer or fender that has become dislodged from Craignure pier, on Mull. However, both the island’s ferry users group and Mull Community Council claimed the pier, that helps to accrue more than £1.5 million in revenue each year for the local authority, was damaged and needed to be repaired immediately. It is understood the piece of wood was used as a buffer or fender to allow boats to manoeuvre into position on the pier. However, the P&J was told by council officials that this particular buffer had not been used for some time, as it was higher in the water than was required for current vessels using the pier. In a statement from Mull and Iona Ferry Users, it said: “Services to Craignure were suspended because one of the timber fenders on the pier fell off. “This comes just 10 days after we held a meeting with council officers where we were assured that the pier was ‘fit for purpose’. The committee are now insisting that the council carry out an urgent independent detailed inspection of all the fendering on Craignure Pier, and act urgently upon whatever recommendations it makes. An Argyll and Bute Council spokesman said: “We apologise for the brief disruption caused to ferry services by a displaced section of timber, which was successfully removed on Sunday morning. 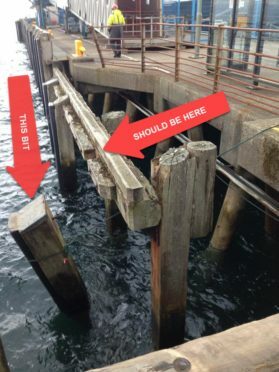 “We can confirm that this timber section was not an integral part of the pier’s structure, and removing it will have no implications on the use of the pier for scheduled service vessels. Disruption to the service meant passengers had to drive via Lochaline on Sunday morning, until the ferry resumed at 12noon.